LAHORE: Jamaat e Islami (JI) Ameer Senator Siraj-ul-Haq, has said that National Accountability Bureau (NAB) chairman had been appointed with the consent of the ruling party of Pakistan Muslim League- Nawaz (PML-N) and Pakistan Peoples Party (PPP) therefore there should be no objection by the aforementioned parties to the workings of NAB. Siraj-ul-Haq expressed these views while addressing a public meeting in Narowal on Saturday. He urged the judiciary to ensure an effective accountability so that the nation could get rid of the plunderers. He said those ruling the country considered themselves above the law and accountability. 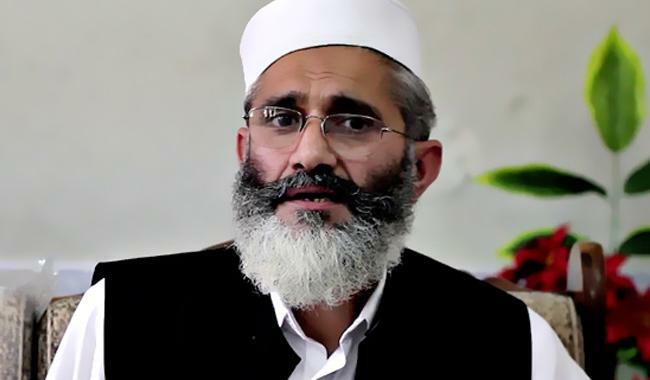 Sirajul Haq stated that according to reports of international organizations, around 0.5 million people in the country were suffering from hepatitis while more than 80,000 were suffering from cancer. Around 35 per cent of the Pakistanis were suffering from blood pressure while 88 per cent of the people could not get clean drinking water. He said that it was interesting that the rulers spent years in Britain and the United States of America but were not ready to follow the good policies of these countries and were the first to board planes to visit overseas for their own treatments. The JI chief called on the government to improve the situation of the common person in the country and provide relief through comprehensive policy measures.